A body at rest tends to stay at rest. A body in motion tends to stay in motion. Get in motion. Stay in motion. Water is the single most critical nutrient to your body. Therefore, drinking sufficient water is essential to your health and, because it is excreted by the body in various ways all day long, it is important to replace it throughout the day. When your water intake does not equal your output, you become dehydrated. Fluid losses occur continuously — from skin evaporation, breathing, urine and stool — and these losses must be replaced daily to maintain good health. Even mild dehydration can cause daytime fatigue. I’ve long been a proponent of drinking a tall glass of water upon waking each morning, before breakfast or even coffee. Caffeine is a diuretic, meaning it increases your urine output. For approximately every 100 milligrams of caffeine you consume – the approximate amount in one cup of coffee or two cups of black tea – you should drink an additional cup of water to compensate for the drug’s diuretic effect (yes, caffeine is a drug). Your body also excretes water while you sleep, through perspiration and breathing, so even if you’re not a coffee drinker, this lost water should be replaced immediately each morning. Fluid losses are heightened during strenuous exercise, in warmer climates, at high altitudes and in older adults, whose sense of thirst may not be as discerning. Your body is composed of about 60% water. The lungs are about 83% water; the muscles and kidneys are 79% water; the brain and heart are composed of 73% water; and even the bones are 31% water. Your body fluids are critical to digestion, absorption, circulation, transportation of nutrients, creation of saliva and maintenance of body temperature. Body fluids transport waste products in and out of cells. The main toxin in the body is blood urea nitrogen, a water-soluble waste that is able to pass through the kidneys to be excreted in the urine. When you’re getting enough fluids, urine flows freely, is light in color and free of odor. When your body is not getting enough fluids, urine concentration, color and odor increase because the kidneys trap extra fluid for bodily functions. Water is a great appetite suppressant, making you feel fuller. Drinking a glass of water before meals can curb your appetite, helping you to eat less without feeling hungry. Because water is 100% calorie-free, substituting it for higher-calorie beverages can help with weight loss. Water also helps you burn more calories. The amount of calories burned by the body at rest is known as resting energy expenditure. In adults, resting energy expenditure has been shown to increase by 24–30% within 10 minutes of drinking water. This lasts at least 60 minutes. The effects are heightened by cold water. When you drink cold water, your body uses extra calories to warm the water up to body temperature. Two separate studies showed that increasing water intake to over 1 liter (34 oz) per day resulted in an extra 4.4 pounds of weight loss over a 12-month period. That’s roughly 17,000 additional calories burned annually. Water also increases the body’s ability to metabolize stored fat. Inadequate water intake can cause fat deposits to increase, while sufficient water intake can actually reduce fat deposits. Muscle cells need to maintain a balance of fluids and electrolytes to avoid fatigue, weakness and shrinking. In short, inadequate fluid intake can cause performance to suffer. Again, your muscles are 79% water. Research has shown that when cells lose water, protein production can slow down and protein breakdown can speed up. This could hamper post-exercise muscle protein synthesis. Greater muscle breakdown results in less new-muscle growth. Aerobic performance, such as running or cycling, can decrease when body weight drops just 2-3% as a result of dehydration. Power generation can also become compromised with the loss of just 3% in body weight. Researchers determined that when test subjects were dehydrated by 3%, total repetitions performed were significantly lower. The subjects also perceived the exercises as more difficult and they needed longer for their heart rates to recover. Adequate water helps to maintain a normal digestive tract. It helps to properly metabolize food and transport nutrients. Water also helps to maintain normal bowel function. Adequate hydration can prevent constipation. Your skin contains 64% water. Dehydration makes your skin look dry and wrinkled. Proper hydration may help prevent wrinkles and may even decrease some. Being well hydrated can also help rid the skin and body of toxins. Healthy, well-hydrated skin also easily absorbs water from moisturizers and creams, increasing the benefit of skincare products. Your heart pumps about 2,000 gallons of blood a day and it is able to pump blood more easily when well-hydrated, allowing it to work more easily and efficiently. Water also helps maintain blood pressure. Dehydration can cause blood to become thicker, increasing blood pressure. Dehydration causes strain on your heart because your blood volume decreases when you are dehydrated. This results in your heart beating faster and working harder. Water delivers oxygen throughout the body. Blood, which is more than 90 percent water, carries oxygen to all parts of the body. 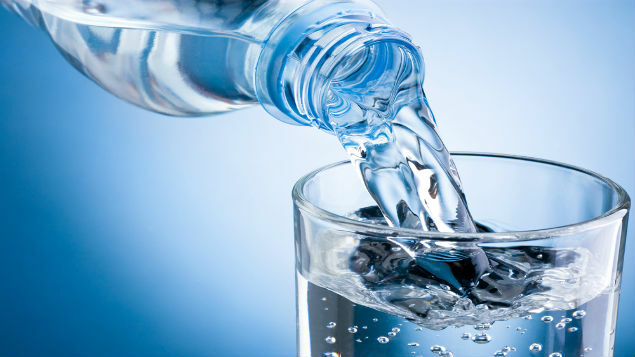 The National Academy of Medicine (NAM) recommends a total daily water intake of 3.7 liters (15 cups) for the average adult male and 2.7 liters (11 cups) for the average adult female. Water needs vary tremendously, according to the individual, and are dependent on factors such as temperature, altitude and activity level. If you’re exercising, you need more water than when you are sedentary. People who exercise regularly may need more daily water intake than those who are not very active. The American College of Sports Medicine’s guidelines recommend that people drink about 17 ounces of fluid roughly two hours before exercise. During exercise, they recommend that people start drinking fluids early, and drink them at regular intervals to replace fluids lost by sweating. Eating more fruits and vegetables can aid hydration due to their high water content. About 20% of our fluid intake comes from foods. Having a beverage with every snack and meal will increase hydration. Drink plenty of water. Eat healthy. Sleep plentifully. Stay healthy.